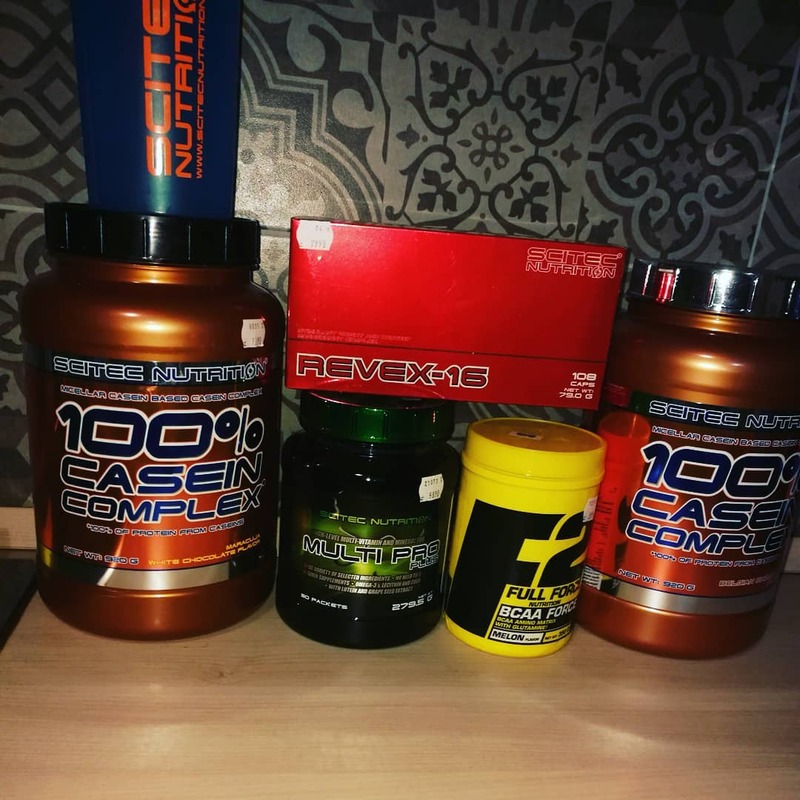 Fat LossScitec Revex 16 - 108 kaps. 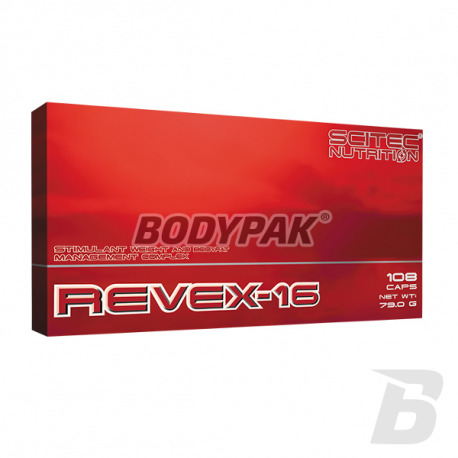 Scitec Revex 16 - 108 kaps. Revex-16 to najnowocześniejszy spalacz tkanki tłuszczowej, dzieki któremu pozbędziemy się dodatkowych zbędnych kilogramów tkanki tłuszczowej głównie z okolic brzucha. Revex-16 is the most advanced burner of fat, so that we get rid of unnecessary extra kilograms of body fat mainly from the abdominal area. 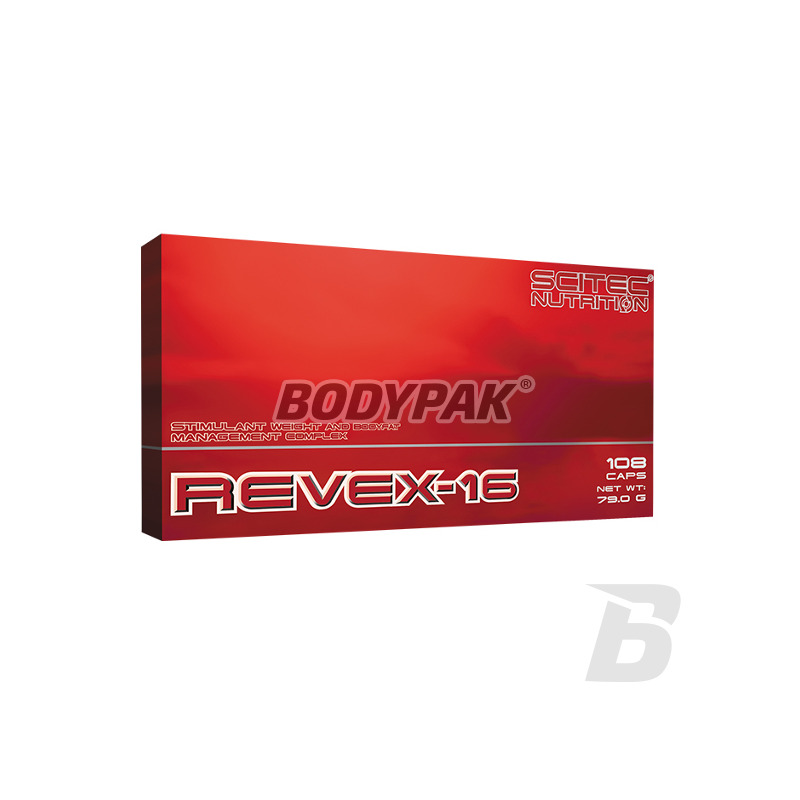 Revex-16 contains the active components as 16 through which besides increase energy expenditure expedite adipose tissue metabolism and will inhibit appetite. - Phenylethylamine - show stimulation properties, increase the level of Dopamine, increase energy levels, improve mood, reduce physical and mental fatigue. L-Tyrosine - is a precursor to adrenaline, dopamine and norepinephrine (necessary for proper operation of the nervous system), stimulates, increases alertness and concentration. Tyrosine is also used by the body for the synthesis of hormones called thyroxine accelerating metabolism, elevating the level of Growth Hormone, improving well-being. The rest of acetyl, after disconnecting from Tyrosine can be used eg . : in the synthesis of acetylcholine, an important neurotransmitter. - Caffeine - the most famous in the world relationship of a thermogenic. A stimulating effect, reduces the levels of Adenosine inhibits the breakdown of cAMP - thus strengthens occurring in the body processes thermogenic (release of energy created during the combustion of fats in the form of heat) and lipolytic (breakdown of fats into free fatty acids). - Garcinia Cambogia - the Tamarind Tree. It contains HCA (hydroxycitric acid) - inhibits the lipogenesis (the formation of fat from carbohydrates and proteins) which reduces deposition of excess fat tissue. By increasing glycogen reduces appetite, which is very often the cause of failure of any kind of diet plans. Exhibits catabolic terms of fat and protein catabolic terms, thus helping you achieve a leaner, more muscular body. - Hesperidin -strengthens blood vessels, improves blood circulation, exhibits antioxidant effect, increases the activity of vitamin C and helps maintain the correct structure of collagen. It is generally found it with other related compounds such as quercetin or rutin and vitamin C. Inositol -bierze participation in the processes related to the metabolism of lipids (including cholesterol). - Naringinina -ekstrakt grapefruit standardized to 98% of the content naryngeniny, which increases the effectiveness of caffeine supplementation. This component gives the characteristic bitterness of citrus fruits, but also has other interesting properties. Research has shown that the combined oral supplementation, as a result of specific interactions of metabolic naryngenina increases the level of caffeine in the blood by as much as 28% and prolongs its activity in the body by almost 30%. Additionally it naryngenina works thermogenic and together with caffeine activates fat metabolism, leading to a reduction of subcutaneous inventory and increase the amount of useful energy. - Resveratrol also been implicated in the regulation of energy balance, which prevents obesity and its pathological effects, which can in extreme cases it impossible to move because of the excessive weight. Operation of resveratrol is related to the activation of proteins of the family of sirtuins. Are enzymes that allow survival in adverse environmental conditions. Are activated by caloric restriction, reduced ambient temperature and stress antioxidant. SIRT1 protein plays an important role in maintaining glucose homeostasis and regulation of insulin secretion by pancreatic islet β cells. In the case of fat it stimulates the mobilization of fats and inhibits the formation of new adipose tissue. - Acid Alpha Lipolowy - intensifies the absorption of amino acids and creatine. It is a great transporter, as it operates insulinopodobnie. Regulates glucose levels, it is a key supplement in supporting the diet. ALA is recommended for people at risk of atherosclerosis, diabetes or heart disease or liver disease. They should use him as obese people, smokers and elderly patients. - Bioperine - is an extract of black pepper that could improve the intestinal absorption of up to 1000-fold. Increases diuresis, improves blood circulation, stimulates the nerve endings in the GI tract, enhancing the secretion of digestive juices and thus enables better use of taking with it the substance. - Picolinian Chromium - an element essential for life and proper functioning of our body. Responsible for regulating the activity of many enzymes, it reduces the production of insulin and interacts with it in the process of protein synthesis, reduced levels of both total cholesterol and LDL which, promotes glycogen synthesis, increases the concentration of glucose in muscle and helps to regulate appetite. 2x a day 2 caps. Ingredients: extract (fruit), Citrus aurantium 10: 1 Beef gelatin, L-phenylalanine, L-tyrosine, caffeine anhydrous extract (fruit) Garcinia cambogia 20: 1 extract (leaf) Camellia sinensis 8: 1, extract (fruit), Momordica charantia 15: 1 extract (root) Taraxacum officinale 16-19: 1, hesperidin extracted from fruits of Citrus aurantium (93%), inositol, naringin are extracted from the fruits of Citrus paradisi (93%), quercetin dihydrate extracted from the buds of Sophora japonica (84%), extract (root) Polygonum cuspidatum 8-10: 1, alpha lipoic acid, Bioperine® - extract (fruit), Piper nigrum 50: 1, pigment (titanium dioxide, red iron oxide, Allura red AC **), chromium Picolinate.